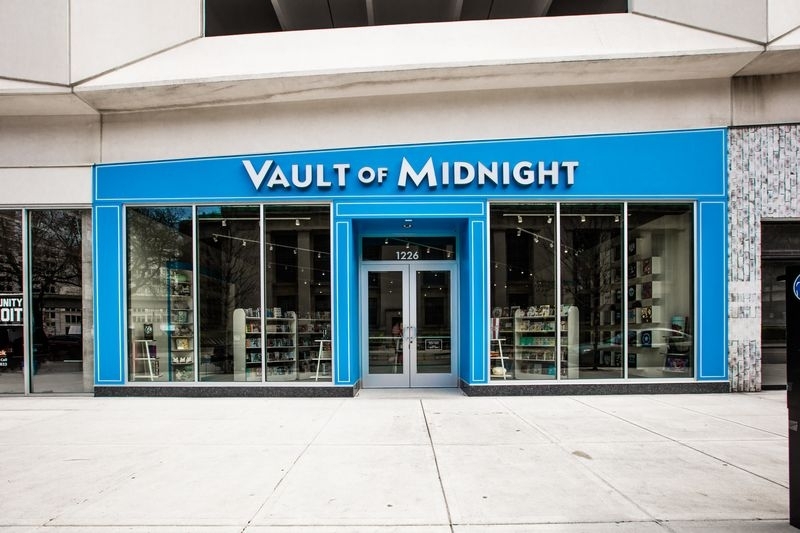 Today Vault of Midnight opens. It's an awesome comic book store from Ann Arbor that has now opened a branch very close to ICHQ directly in downtown Detroit. Next time you're in town I highly encourage a visit. First floor of the Z. Very cool spot there. Library, Gratiot, Grand River, and Broadway. Same block as Henry the Hatter. Can confirm that Vault of Midnight is very, very cool. I'm going Saturday for Free Comic Book day. I went last night with Nicole and Perry. It's small but the selection is good and it's super clean. They do board games too? They have a decent amount of shelf space dedicated to board and card games, but they don't have a gaming area. The entire store is product. There is no meeting space. I think the A2 space has some meeting area in the basement, but I suppose that's not super relevant. Too bad the D store couldn't be bigger. Too bad the D store couldn't be bigger. Went today. Cool spot. Probably my go to place for new comics. @Church4252 how is Civil War II? I haven't checked it out yet. 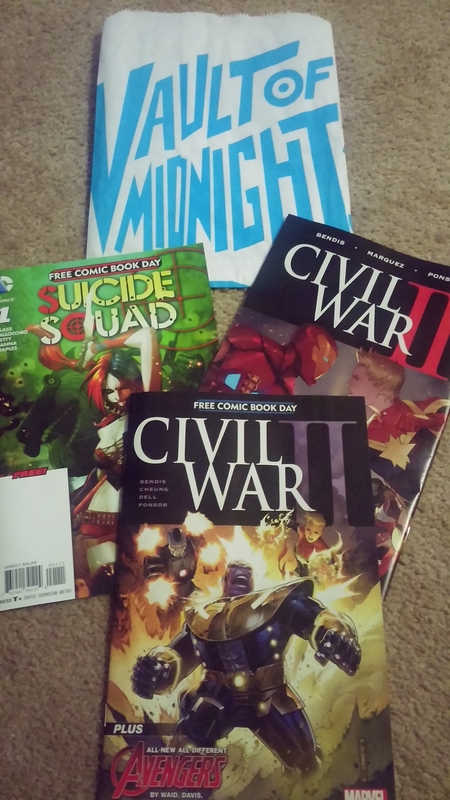 I went for Free Comic Book Day. The staff is really great. Everyone is super friendly and willing to help. Selection is pretty solid overall. 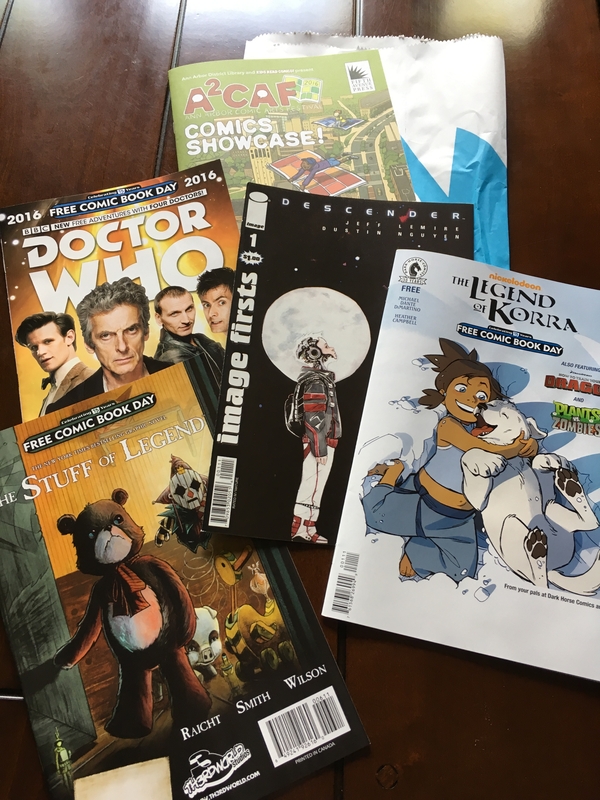 Good mix of back issues and graphic novels to catch up on current series. The store is also really well designed, easy to navigate and has a great overall vibe. I plan to pick up next issues / volumes of all of the above in another week, plus Saga vol 1. I've basically figured out how the store is arranged now. They don't normally carry Legend of Korra and I haven't worked up to asking for it yet. The Stuff of Legend was actually a special order for me, tho. First time I went into a comic book store and requested something. Pretty bummed they don't sell Magic cards aside from individual booster packs. They don't even have a booster box price (they charge per-pack MSRP x 36, which is ridiculous), let alone a play area. I was really expecting them to be far more gamer friendly than they are. But hey, this whole comics thing is new to me so I'm enjoying it for now. Oh, also. This is literally a 2 minute walk from my office, so if you go during business hours and don't ping me so I can come down and say hi you are officially a jerkbag(tm). I went in there Monday and dropped a bunch of cash to buy vacation reading (and I brought @Jokke & @BobbyDigi & @DigiKid to see it! Jokke bought quite a few books himself). A couple of the staff told me about East of West and basically summarized the plot to me and absolutely assured me that if I bought volume one I would thank them and be back for more in a few days. They were like "You are the fifth person in a week I've given this spiel to and they've all thanked me". Welp. As you can see above, the prophecy was correct. They had a 20% off sale today for their 20th anniversary so I basically said screw it and bought the rest of the series (and several other things). I need someone to keep me out of that store for a little. I was really hoping I didn't like Doctor Strange or Scarlet Witch but I did. omg now @PinkInDetroit dropped a stack of books on my desk and now The Wicked + The Divine has joined the list, so now I'm at 10 series. Alright enough! It's a nice store. Very neat and easy to browse. Birthright - Piqued my interest enough to buy graphic novel #1. Black Magick - I liked where this is headed a lot, so I grabbed graphic novel #1 to see if it unfolds nicely. Saga - I have the first two graphic novels but they didn't really grab me. I may pick this up again later. Black Panther - I feel like it assumed a lot of insider knowledge, and that didn't get any better after 3 issues. Every comic series doesn't need to go back to origin stories, but one of the reasons I dislike super hero comics is that they're all on storyline #27 and think you've read at least 10 of them. I don't feel like this one cleared that hurdle. Doctor Strange - This series had the courtesy of a 1-page origin story and it only really has 1 character to worry about, and it does a great intro "pre-opening-credits"-stlye sequence to kick off. I wanna read this badly but Marvel prices its graphic novels way higher than Image so it keeps getting cut due to budget before I get to the cash register. Scarlet Witch - Same as Doctor Strange, basically. Also they do every issue as a different artist which I deeply dislike. If the Wicked + Divine had continued that (they did it in book 2) I woulda dropped it, frankly. Two years after getting a teaser Legend of Korra book at Free Comic Book Day, I still have not successfully been able to walk into Vault of Midnight and pick up graphic novel #1. I care just short of enough to special order it, it just seems incredible to me I've never seen it in stock. The Hudson building construction has started in earnest (the new skyscraper), so street parking around the store is impossible, now. Use the Z-Lot parking garage (same block) and get a validation code from Vault before you leave. Parking is $10 normally... so honestly even if you're there for something else, I'd get a $4 comic book for the validation.